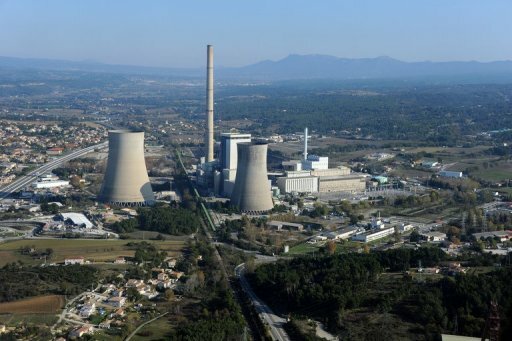 A partially coal-fired thermical power station in Gardanne, southern France, pictured on November 17, 2011. France will reduce use of fossil fuels by 30 percent by 2030 as part of a strategy to halve overall energy use by 2050, President Francois Hollande has announced. PARIS (AFP) – (AFP) – France will reduce use of fossil fuels by 30 percent by 2030 as part of a strategy to halve overall energy use by 2050, President Francois Hollande announced on Friday. “Fossil fuels still account for more than 70 percent of our overall energy use,” Hollande Hollande said, as he unveiled a two-day conference on the environment in Paris. But, he said in reference to the 2050 target, “let’s not be dogmatic about this — if we are little bit off the mark, it won’t be disastrous.” Hollande outlined several measures to help reach the goals. They include “smart, carbon-less” cars, for which measures would be needed to encourage installation of electrical recharging points in French towns and cities, he said. A draft law on “energy transition” will be put to parliament in the first half of 2014, he added. This would rise to 14.5 euros ($19.5) per tonne of CO2 in 2015, bringing in 2.5 billion euros (3.37 billion), and to 22 euros ($29.7) per tonne in 2016, which would yield an estimated four billion euros ($5.4 billion).